Alice in Wonderland – Ready for some magic? I don’t know if you read the books. Quite hard to follow, quite confusing, more a succession of events than a story but it is interesting to read. I’d recommend it any time. I won’t say it is a great book. It isn’t bad either. It just gives you a strange feeling. As I said… interesting. But today, the subject isn’t the book. It’s the 2010 movie. You know, if a movie is directed by Tim Burton, I usually know it will be good. But, if it is directed by Tim Burton and includes BOTH Johnny Depp and Helena Bonham Carter, I am sure it will be OUTSTANDING. Honestly. Tim Burton + Helena Bonham Carter + Johnny Depp = Winning Formula. I went to the theater to see it when it came out in France. It might be one of the few movies I saw that actually used the 3D, if only a tiny bit. When Alice fell, you know, it really felt like I was falling too. A month, it was on TV so I thought it was a good opportunity and convinced my mother it was the best movie to watch that night (but it had competition! Legally Blonde was ALSO airing that day. Luckily I watched it just a week ago or Alice wouldn’t have stood a chance). My TV allows to choose the language on some channels so I put it in English. I can even choose to put the subs if needed. Well, it was very much needed. I was really, really upset. I mean, I am supposed to understand English better than that! Yesterday it just seemed like I’d never heard English before. I hate when it happens. I feel dumb. I did not understand enough to really appreciate the movie, which is a shame, so I ended up putting the subs. I know, I know, it’s terrible. Still better than watching it in French but… it feels like a failure to me. Anyway~ Once again, I thought “ah, really, THIS is something only Tim Burton can do“. Alice’s adventures in Wonderland is a weird, fantastic and somehow disturbing story and I think it suits Tim Burton‘s universe really well. In fact, I can’t think of any other director who would have done such a good job with this story. What do you think? Could someone else have done a better job? Let’s talk about this movie a bit. It is said that she is almost 20. Well, I am 20 and I think she looks much younger than me. Mia Wasikowska was 21 in 2010, but with the make-up and all, she looks more 16 than 20 to me. She makes a really good Alice, I think. I am happy they didn’t try to choose someone more famous. Mia Wasikowska had done some stuff before, but she wasn’t that well known yet. I think it was a smart choice. And I love the blue dress she wears at her “engagement party”. I want the same. There is a trend going on turning our fairy tales heroines into warriors, which I find a bit weird but overall, I liked this version of Alice (the character) more than any other. The hatter. Johnny Depp. I bet you already understood that I like him a lot. He is charming and as an actor, I don’t think anyone can compete. He is in a category on its own, so I guess comparison is hard. He can pull off weird characters and never gives an impression of déjà vu. Each time, he creates a brand new person, with its own mannerism and way of speaking and… well, it is just amazing. So, to come back to the Hatter, Johnny Depp was an excellent choice. No-one else could have played it as well as he did. And he looks great with make-up. Can you think of anyone who would look so charming with make-up like this? As for the Queen of Heart (promise, I’ll stop at her, other characters are all secondary), Helena Bonham Carter is, as ever, outstanding. She is fabulous and of course, if you watched Harry Potter, you know just how good she is at playing the mad and cruel/heartless character. I even ended up liking the Queen of Heart, which seemed totally impossible reading the book (but of course, it is also due to the script. She does become likeable at some point). All of that to say this movie was a win-win to me. Everything was at its place, everything fitted. I often watch a movie and think “if they had cast somebody else for this character, it would have been better“. If I think that, it probably means that at some point they did a mistake, because I am very easy to convince. First of all, I felt awful for poor Alice. I would HATE to be proposed to in public. Though I understand that some people might like it, I would feel pressured and who wants to be pressured at such a moment? And, honestly… honestly who would want to marry Hamish? He doesn’t even try to be nice to Alice. I know Tim Burton disagrees (as he stated before in interviews), but it can be seen as some sort of sequel of the books. Alice went to Wonderland when she was a little girl (=the book) and comes back (=the movie) without remembering anything about it. But it is not exactly a sequel either. We know she came before, when she was a little girl. But what happened back then we have no idea. Wonderland changed since she first came. For example, the Queen of Heart killed the King (she says she did so because he would have left her anyway). The atmosphere changed. 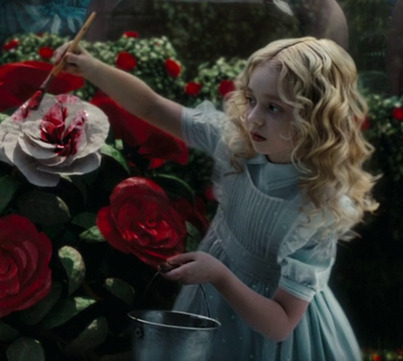 The Hatter famous sentence “Why is a Raven like a Writing Desk” was included to the movie, the Queen still plays cricket with flamingos and yells “Off with his head!” all the time… It is Alice in Wonderlandwithout being an strict adaptation of the books. This is probably why I like it so much. The book was a nonsense but the movie uses the book to create a story. It is briliant. Tons of little references to the books are made. You may not catch them the first time you watch the movie, so watch it several times! The plot in itself is really entertaining. It is pretty classic, you know. Alice comes to Wonderland only to discover she has to get back the Vorpal Sword and kill the Jabberwocky to save everyone from the bad Queen. However, though she is Wonderland’s only hope, she doesn’t think she is the right Alice. Only at the end, thanks to Absolem wise words does she understand that she has to face her destiny and save her friends. Said that way, it does seem a bit simple, but it is a really good movie, and you SHOULD watch it. I’ll be quick on this part, as you already know what I think of Alice, the Hatter and the Queen of Heart. The Knave is as bad as expected. He is so bad that he probably is the ONLY character I hate in the movie. He is ugly, he is petty, he is opportunistic and he is heartless. I mean, at the end of the movie, even the Queen of Heart does say something that makes me change my mind on her. She is banned from Wonderland with the Knave, and tells him “At least we have each other“. Isn’t it cute? Doesn’t it show that somewhere under her cruel appearence hide human feelings? I felt terrible for her because she does love the Knave and he heartlessly tries to kill her, and then begs to be killed just not to be with her! The poor Queen seems completely heartbroken. The Cheshire Cat is one of my favourites. I know he isn’t very important in the movie, but I like him and what he represents. We understand from the Hatter’s words that in the past Chess has been a coward and saved his head instead of helping the others. But during the movie, Chess does try to help. He saves the Hatter from being beheaded. He does help Alice several times. It shows that whatever you did in the past, you can improve. You can do better. I like this idea. The character who moved me the most (apart from the Hatter) is probably Bayard the bloodhound. He puts his own life in danger, as well as the life of his wife and kids to save Alice. He doesn’t die, but he is ready to sacrify himself to help the cause, so I guess he is one of the true heroes of this movie. Costumes are all great, not much to say about it; I particularly love the Queen of Hearts’ dress, and, as stated before, Alice “real world” dress. I also absolutely loved the Hatter costume, it totally fits him and helps create that “mad” aura. As for the scenery… well, I said it. 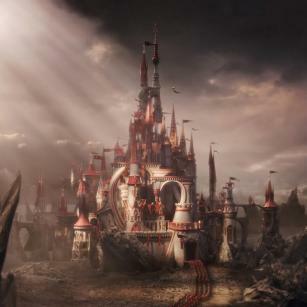 Tim Burton has that ability to bring you to new worlds and it was the case here. Everything is splendid, beautiful, fantastic. It doesn’t really try to look realistic, and it’s better that way. The Red Queen’s palace is FABULOUS. I can’t describe it well enough so I won’t. I also have to talk about the final battle set. It IS probably the best scenery of the whole movie. Even if I love castles. It is a giant chessboard (which does recall the second Alice book) with some sort of greek ruins on the side. Really pretty. Am I the only one… Am I really the only one who was awfully sad and heartbroken that Alice didn’t ended up with the Hatter? Honestly? He was just SO cute. So saaaaad! Whyyyy leaving, Alice! The Hatter says “You could stay” and you leaaave! Whyyyy? Look at his eeeeeeyes! You caaaan’t leave him! You can’t!! This is cruelty! It tells you just how frustrated I was at the end of the movie! Though I suppose it will sound weird to anyone who didn’t watch it, I swear Alice and the Hatter were cute together. She is not the little girl Alice from the book or the Disney animated movie, so it isn’t that creepy. If you watched Alice in Wonderland, do you agree with me? Did you think it was sad that Alice returned to the “real world”? I hear rumors about a sequel of this movie. What do you think? Is it a good idea? What kind of story would you like to see in this sequel? Which actors should come back for this? I absolutely loved the film Alice in Wonderland, very well done! It’s been a while I posted on your blog. So sorry for my absence! I wanted to let you know my blog had changed url to http://nynyonline.co.uk and if you plan to follow it still, click the follow button on the bottom right :) I have two articles for you to look at when you have the time.